Tylden is a rural village between Woodend and Trentham, 74 km north-west of Melbourne. It is a former mining township on the Little Coliban River, and is south of the three reservoirs on the Upper Coliban River. Tylden was named after Brigadier-General William Tylden (1790-1854) who died in the Crimean War. Tylden is situated north of the Dividing Range, in undulating farmland that has been used for crops as well as grazing. The district’s first school was opened at Tylden South in 1858 by the Wesleyan church. Tylden itself had two schools, opened in 1861 by the government and the Presbyterian church. The locality of Tylden East later became known as Carlsruhe Railway Station. Tylden is at the junction of roads from Kyneton and Woodend which lead to Trentham and Daylesford. It was the site of probably the first flour mill in the Kyneton district, a water-powered structure built in 1841. Known as Willoughby’s corn mill, it is depicted in Lewis Jones’ Flour mills of Victoria, 1990, and its site is now occupied by Tylden Quarries Pty Ltd. In the mid-1860s Tylden had five hotels. Tylden’s township shrank to a village in the first half of the twentieth century, but in the 1960s it received a boost when the school was expanded to receive children from several small surrounding schools which had been closed. Since then its population has increased. 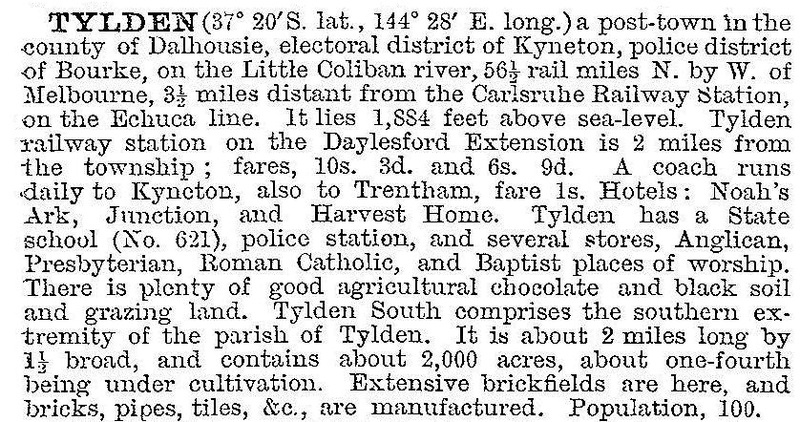 Tylden has a school (96 pupils, 2014), restaurant, a general store, a hall, and a quarry. Homebush homestead, built from local bricks by a pioneer pastoralist, is a short distance west of Tylden.